Lancaster County is known for its Dairy Farms, resulting in an abundance of fresh and flavorful local milk for folks to enjoy. But it’s always a welcome treat when farmers take it a step further and use it to whip up creamy, mouth-watering ice cream. In this blog, we’ve highlighted ice cream stops and shops that feature locally made ice cream that are definitely worth a visit. What better way to spend a summer getaway than sampling ice cream while staying at one of our Authentic Bed & Breakfasts of Lancaster County? 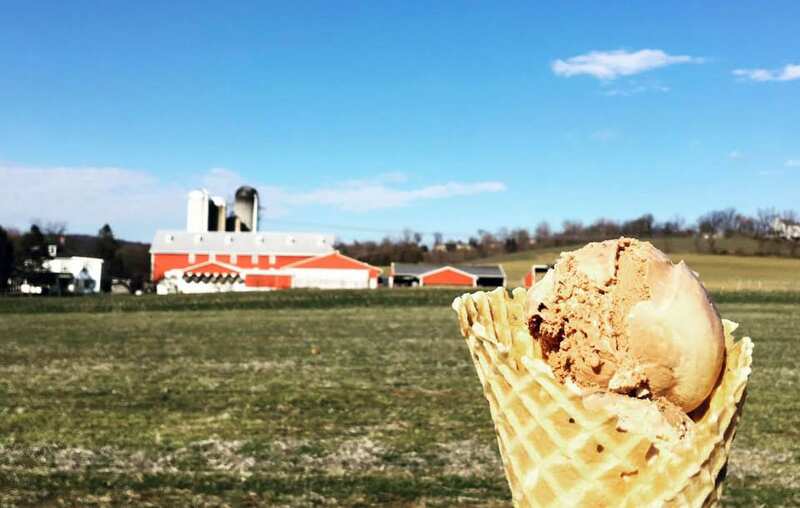 Pine View Dairy is located at 2225 New Danville Pike, Lancaster, and not only churns some of Lancaster’s best ice cream, but they also invite customers onto the farm. The dairy offers over 25 flavors to choose from including butter pecan, orange creamsicle, maple walnut, classic flavors and much more. In addition to its ice cream, Pine View sells a variety of flavors of milk, local produce, baked goods, sandwiches and other items. You can enjoy your ice cream on the patio or take a stroll around the farm and watch the cows being milked. Visit Pine View’s website for hours and more information. Relatively new to Downtown Lancaster is Penny’s, scooping locally made Carmen & David’s ice cream and creating amazing sundaes with homemade confections and sauces. There is indoor and outdoor seating at Penny’s or keep an eye out for the Penny’s ice cream truck, often spotted at events or downtown. Enjoy a unique ride through Lancaster trying different ice creams during a scooter tour with Strasburg Scooters. After a lesson on driving a scooter, you’ll follow along with a group on an ice cream tour beginning at a local dairy where you’ll receive a lesson on how to make ice cream, followed by a few stops at local ice cream shops. Book a scooter trip during your next visit, you won’t regret it. Other spots to visit for local ice cream include Chestnut Hill Cafe, 532 W. Chestnut Street, Lancaster; Oregon Dairy, 2900 Oregon Pike, Lititz; Lickity Split, 209 E. Main St., New Holland; Scoops Ice Cream & Grille, 312 Primrose Lane, Mountville; Boehringer’s Drive-In, 3160 North Reading Road, Adamstown; Strasburg Creamery, 1 W. Main St., Strasburg; and Isabella’s Ice Cream Parlor, 110 E. Main St., Lititz. Wherever you find yourself while visiting an Authentic Bed & Breakfast of Lancaster, be sure to put an ice cream date on your list of things to do. You’ll be glad you did. Courtesy of the Authentic Bed and Breakfast Blog.